There’s only one more day until Christmas, and there’s still time to take a few moments out of your day to tap into the spirit of goodwill and help families in need in Westminster. All you need to do to to get involved is text ‘WBAF15’ and your donation amount in £’s (e.g. ‘WBAF15 £3’) to 70070. We are grateful for every donation, no matter the amount. 100% will be passed onto us by Vodafone and JustTextGiving, and enable us to carry on supporting local families in poverty over the coming year. 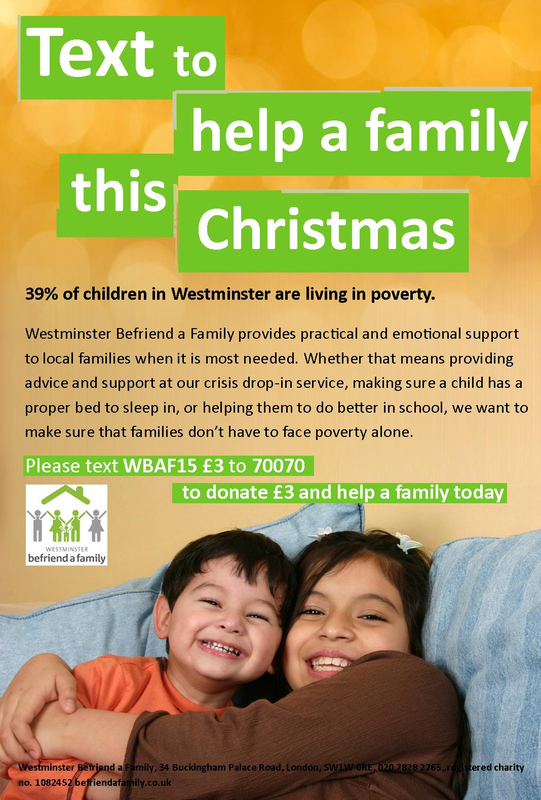 We’re running this campaign throughout December, so you can donate after Christmas as well. Thanks to the kindness and enthusiasm of those in the Westminster community – including our local schools and venues who collaborated to bring us four wonderful Christmas Carol concerts (read about this on our blog here) – and the valuable efforts of our volunteers who donated their time to be bucket collectors and to spread the word about our text campaign, lots of people have so far donated a smile and, most importantly, practical aid to the disadvantaged children of Westminster and their families. We strongly believe that we can do much more, but in order to do so we need your help. Please follow us on Facebook and Twitter so you will always be up to date, share our initiatives and projects with your friends and family, or help us by donating. Even the smallest amount makes a difference and can mean that a family in need gets the help they deserve Join us in the coming year to help improve local children’s lives and give them a chance at a brighter future. Merry Christmas and a happy New Year from everyone at WBAF!